The mention of the word dementia can bring up feelings of fear to those who have loved ones suffering from it to feelings of uncertainty as some dementia types are progressive. 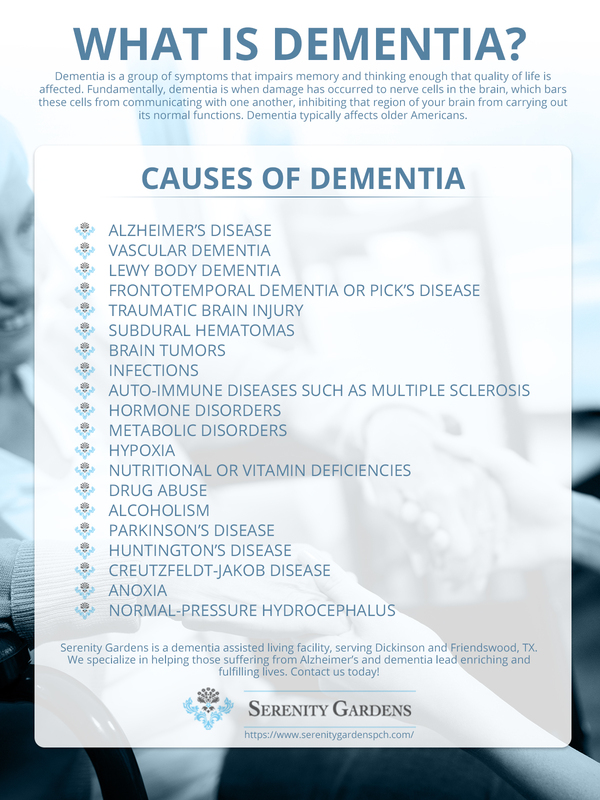 Serenity Gardens in Friendswood, TX, aims to dispel some of the uncertainty you may have with regards to the causes of dementia with this blog post. We offer assisted living care for those suffering from Alzheimer’s and dementia. Schedule a visit today! Dementia itself isn’t a disease; it’s a group of symptoms that impairs memory and thinking enough that your quality of life is affected. Fundamentally, dementia is when damage has occurred to nerve cells in the brain. Alzheimer’s disease. Alzheimer’s disease is the most common cause of dementia, responsible for 50 to 70 percent of cases. Alzheimer’s disease is an irreversible brain disorder that causes a loss of brain cells and destroys memory and thinking skills. Damage to blood vessels. Known as vascular dementia, this second most common type of dementia (accounting for about 20 percent of cases) occurs when blood vessels that supply blood to your brain are interrupted, usually by a stroke or atherosclerosis, which is caused by deposits of fats on the inside of the arterial walls. Abnormal clumps of protein in the brain. Known as Lewy body dementia, Lewy deposits are abnormal deposits of a protein called alpha-synuclein in the brain. These deposits affect chemicals in the brain whose changes that can lead to problems with thinking, movement, behavior, mood, and dementia. Breakdown of nerve cells in the front part of the brain. Frontotemporal dementia or Pick’s disease is a disorder that refers to progressive nerve cell loss in the brain’s frontal lobe, which leads to loss of function in those areas, affecting speech, coordination, and motor functions. Traumatic brain injury. This can be from a car crash or from repetitive head trauma such as from playing football. Uncoordinated movement, impaired speech, memory loss, and dementia can result. Subdural hematomas. Subdural hematomas is where bleeding occurs between the surface of the brain and the covering over the brain, which is common in the elderly after a fall. This can cause symptoms of dementia. Brain tumors. This is rare but can result in dementia. Infections (such as meningitis, HIV / AIDS, or syphilis) can cause dementia which is reversible as your body attempts to fight off these infections. Conditions such as multiple sclerosis that result from the body’s immune system attacking nerve cells also can cause dementia. Hormone disorders (disorders of hormone-secreting and hormone-regulating organs such as the thyroid gland) can cause dementia. Metabolic disorders (diseases of the liver, pancreas, or kidneys that disrupt the balances of chemicals in the blood) can cause dementia. Hypoxia (poor oxygenation of the blood) can cause dementia. Nutritional or vitamin deficiencies. Not drinking enough liquids (dehydration); not getting enough thiamin (vitamin B-1), and not getting enough vitamins B-6 and B-12 in your diet can cause dementia-like symptoms. Drug abuse, or exposure to heavy metals. Chronic alcoholism. 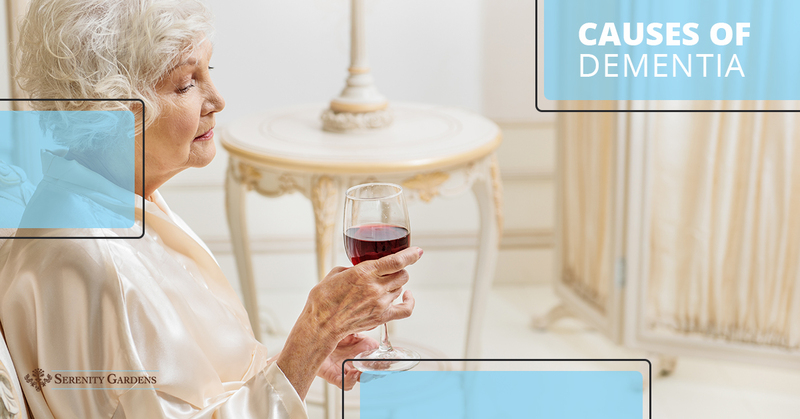 Alcoholism causes people to not get enough thiamin (vitamin B-1), which can cause symptoms of dementia. Parkinson’s disease. This disease, known for its tremors, can cause dementia because Parkinson’s disease is a neurodegenerative disorder that affects the brain. Huntington’s Disease. This disease is where nerve cells in your brain and spinal cord waste away from genetic mutations. This disease affects younger adults, with signs and symptoms usually appearing between the ages of 30 to 40. Creutzfeldt-Jakob Disease. This disease is rare, degenerative, fatal brain disorder that causes failing memory, behavioral changes, lack of coordination, and visual disturbances as well as dementia. Anoxia. This condition, also called hypoxia, occurs when organ tissues aren’t getting enough oxygen. Possible causes of anoxia include severe asthma, heart attack, or carbon monoxide poisoning, and can lead to dementia that can be treated. Normal-pressure hydrocephalus. This condition which is where fluid accumulates in the brain, putting pressure on it, can cause walking problems and memory loss. The causes of dementia are varied as one can see and some are reversible and some aren’t, and some we can somewhat control and some we have no control over. The best prevention of dementia is to take care of your body as much as possible. Eating healthy, exercising, and avoiding recreational drugs can help prevent these conditions from occurring. Serenity Gardens is an assisted living home in Friendswood, TX, that is designed to be just like home. Pets and children are always welcome and family is a priority. We are an assisted living home focused on memory and dementia care. Our compassionate caregivers help with daily needs such as bathing or grooming, ensuring residents take their medication, transporting them to the doctor, and providing three home cooked meals a day that is focused on nutrition. We help those suffering from dementia and memory loss lead an enriching and fulfilling life. Contact us today!